By now you know that coconut oil has amazing benefits for literally every aspect of your life. Just in case you needed more uses for your favourite natural oil, here are some incredible ways to use coconut oil in the bathroom. 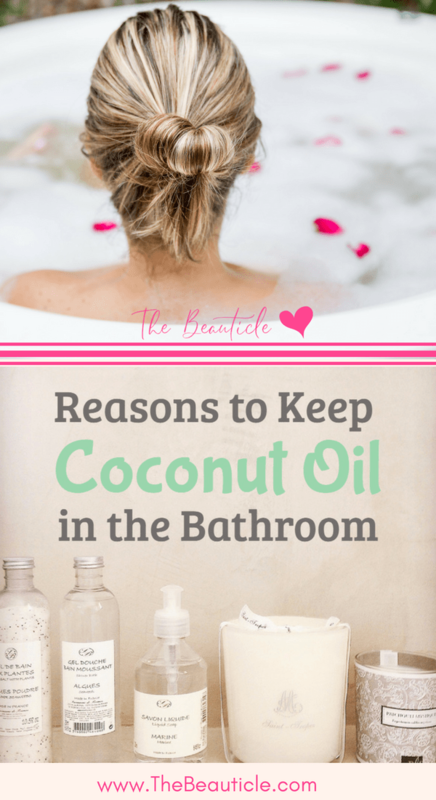 Here is a really simple and great reason to keep coconut oil in the bedroom. Any time you need to moisturize any part of your skin, it is safe to use coconut oil. Something you may not know is that coconut oil is safe to use on burns, cuts, and scrapes, as long as you don’t have an allergic reaction to it. This means while other lotions that are scented or have harsh ingredients that can burn your skin when you have a cut or other abrasion, you can still use coconut oil to moisturize without making matters worse. This makes it a really good moisturizer to have on hand at all times. If you have trouble getting your regular shaving cream to work on your skin, or it leaves behind dry and bumpy skin afterwards, then coconut oil just might be the right answer. By keeping a tub of coconut oil in the bathroom, you have easy access to it when you need to shave. You can use it in its solid form by rubbing a small amount on your face, legs, or other areas that need to be shaved, and just using your favorite razor. This not only gives you a slick and smooth surface for shaving, but the oil leaves behind soft skin afterwards that is moisturized. Coconut oil can also be a really good facial cleanser. Since it is natural and moisturizing, it not only gets rid of dead skin cells from your face and works to remove makeup and other dirt on your face, but it will leave it well moisturized too. You might even find that you don’t need another moisturizer after you have washed your face with it. To use coconut oil to wash your face, massage in a small amount all over your face then apply a clean white washcloth that’s been soaked in warm water on your face. Allow it to stay on your face til it’s cooled. This will help to break up the oil particles so that your face isn’t too oily afterwards but well moisturized. Then simply use the washcloth to wipe clean any excess oil left back. This will help to exfoliate your face as well. Be sure to use gentle strokes in a circular manner to help with blood circulation. Oil pulling should not replace brushing and flossing your teeth, but it can be used in addition to normal oral health practices. It is said that oil pulling helps to detoxify your mouth, pulling out toxins from your tongue and gums for healthier oral hygiene. With oil pulling, you put a tablespoon of coconut oil in your mouth, then start swishing it around. Focus on pushing it back and forth between your teeth with your tongue and do this for as long as you can, aiming for 15 minutes. This helps to clean between your teeth and around your gumline especially. Keeping coconut oil in the home is always a good idea since it has so many different uses for your body, hair, pets, and even pests in the home. For these different reasons, you should always have some coconut oil in the bathroom to live a more wholesome and simplistic life.